What Will It Costs To Evict A Tenant - Eviction Lawyers South Africa | Le Roux Attorneys Inc. In evictions, the most important thing is to stop the financial bleeding. The amount of blood and pain on the landlord’s part, however, depends on factors such as a stubborn tenant who refuses to budge as well as the legal team hired. “Some recalcitrant tenants vacate after receiving the first demand from an attorney to do so. Others put up a fight and remain in the property for longer,” says Willem le Roux, director at eviction specialist firm, Le Roux Attorneys. “The longer the fight to get the tenant out, the more expensive the eviction process. I’d say the ballpark figure is from R5 000 to R15 000. “Get bad tenants out as soon as possible – even if it means offering to write off some of the arrears rental,” he says. 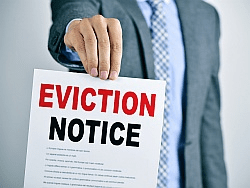 Marlon Shevelew of the rental property law firm, Marlon Shevelew and Associates, says costs to evict a defaulting tenant can significantly escalate in the case of an opposed eviction. South Africa’s official unemployment statistics reveal that a quarter of the workforce does not earn a regular income, with many sectors bleeding thousands of jobs every year – a case in point is Witbank’s stalwart employer, Highveld Steel and Vanadium which closed shop last month, retrenching more than 2 000 workers. In cases such as these, rental defaults will be very high and if the legal route is followed from start to finish – which can take up to 18 months – a landlord may battle to recoup legal and court fees as well as the outstanding rental from tenants. “Presupposing you have an eviction order and a Sheriff is there to forcibly remove the tenants, the cost depends on the size of the property and the number of tenants,” says Michelle Dickens, MD of Tenant Profile Network. “It is notoriously difficult to claim for these costs as part of the overall damages and legal costs. For example, there was a case involving 200 families which cost R2m for the Sheriff to evict the tenants. Can you back your jockey in court? Le Roux notes that landlords and their attorneys should be very sure of winning in court, as a loss will see landlords owing money to the court and attorney, as well as being stuck with the same tenant. Dickens agrees, saying that while evictions are costly, using an attorney who is not well versed in the technical aspects of evictions can end up delaying the process which costs the landlord more in loss of rentals due to the process having to be reset. Thankfully, however, there a number of products on the market which assist in rental guarantee. One of them is RentMaster which was established in 2003 and effectively safeguards landlords’ investments by providing rent guarantees. Its MD, Deon Botha, says: “Landlords’ biggest risk when faced with a non-paying, squatting tenant is the uncertainty and loss of cash flow required to fund the costly legal eviction process. RentMaster takes on the risk of tenant non-payment, thereby providing the landlord with the certainty of knowing that the rent will be paid to the landlord on the first of the month guaranteed. And as a bonus, RentMaster will also fund and manage the daunting eviction process. My brother got divorced and his decree state that him and his ex wife must divide what they have. The only think that they have is a house. His ex wife is staying in and she refuse to leave so that they can sell it. They do not have any children. What is the quickest way to evict ex wife and save money. hello, i have an issue whereby my wife is owner of the property but her aunt has a habitatio right. This was left in a will to my wife and aunt by a deceased aunt. The aunt does not live on the property but instead rents it out to tennants. The tennants pay the aunt and not us. All expenses is covered by us and not the aunt. We tried Legal wise who was no help, then tried a legal clinic who was no help.